Just a few minutes' walk from Earls Court Exhibition Centre, the Hotel Lily is not only an excellent choice for guest attending the exhibitions but also for visiting Wimbledon Tennis Championships, Chelsea Flower Show, Kew Gardens and general sightseeing in Central London. Conveniently located between Earls Court and fashionable Kensington and Chelsea, the local area benefits from fantastic travel links to many of London's major attractions. West Brompton Underground Station is just moments away and offers direct connections to Wimbledon, Hammersmith, Kensington, Victoria and Paddington. Westfield Shopping complex and Stamford Bridge football ground (home of Chelsea FC) are within easy walking distance and the shops of Oxford Circus and the theatres and bars of the West End are just 20 minutes by tube. For the convenience of guests the Hotel Lily also has a private car park (chargeable) at the rear of the hotel. 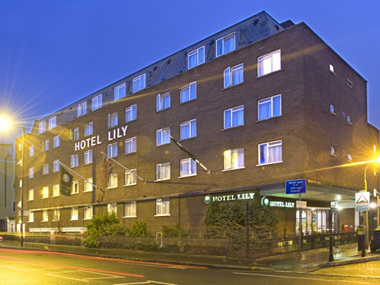 The Hotel Lily is a friendly, economical two star hotel that prides itself on high levels of service and excellence in customer care. The hotel offers 110 recently refurbished guestrooms, and is the perfect base for business and leisure travellers looking for budget accommodation in an area generally renowned for much higher prices. All bedrooms are clean, comfortable, attractively furnished and decorated and enjoy private en-suite bathrooms, central heating, colour televisions, direct dial telephone and tea and coffee making facilities. Attentive, knowledgeable reception staff are available 24 hours a day to assist with all enquiries, provide information about the local area and help guests make the most of their stay. A choice of traditional English or full Continental complimentary breakfast is served daily in the hotel's spacious, air-conditioned dining room, and the hotel's fully licensed bar is a great place to relax and unwind after a day in the city. Our Comments We warmly recommend this well known hotel in Kensington.